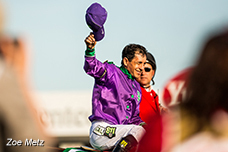 Victor Espinoza was born in 1972 in Tulancingo, Mexico. He was raised with his 12 other siblings on a dairy farm in Hidalgo, Mexico, where he learned to ride horses. Shortly after his 15th birthday Victor traveled to Cancun to assist his older brother, Jose, as a quarter horse trainer. Within a few years he began racing thoroughbreds at Mexico City's premier horseracing facility, the Hipodromo de las Americas. At the age of 17, Victor worked as a bus driver in Mexico City to pay for jockey school. Espinoza did it the hard way, ascending from jockey school in Mexico City in 1992 all the way to leading apprentice at the former Bay Meadows Racetrack and Golden Gate Fields. That was followed by a successful move to Southern California, where he has been leading rider multiple times at all the major meets. In 2000 Victor rose to the upper echelon of jockeys, winning the Breeder's Cup Distaff aboard Spain. In 2002, he won both the Kentucky Derby and the Preakness Stakes aboard War Emblem. In the years between 2000 and 2006, Victor averaged 193 wins a year. On May 31, 2013, Victor won his 3,000th race aboard Flashy Delight at the Betfair Hollywood Park in Inglewood, California. 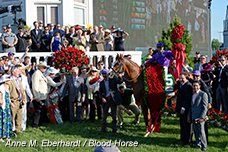 In December of 2013, veteran horse trainer Art Sherman selected Victor as the jockey for California Chrome, a horse that had won only 2 of its 6 starts. Victor rode California Chrome to consecutive victories in the King Glorious Stakes, the California Cup, the San Felipe Stakes and the Santa Anita Derby. 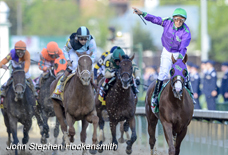 Espinoza capped off the 2014 season by winning his second Kentucky Derby and Preakness Stakes aboard Horse of the Year California Chrome. In early 2015, Victor rode American Pharoah to victories in the Rebel Stakes and the Arkansas Derby that positioned American Pharoah as a favorite going into the Kentucky Derby. Espinoza had an outstanding 2015, becoming the first jockey to win the Triple Crown in 37 years, aboard Horse of the Year American Pharoah. After winning the Triple Crown, Espinoza guided American Pharoah to an impressive record setting win at the Breeder’s Cup Classic to complete the Grand Slam.